Deja Vu... Didn't I just do this? I started MM #125 in November, 2014, and got it producing $$ Novermber of '15. Since then, I have been overwhelmed with work. I built it to make custom kayak paddles, and it is perfect for the task. A friend helped me build it, and his company needs CNC cut parts, which is keeping me more than busy. I've had 3 days off this year. My schedule should open up a bit October through December. 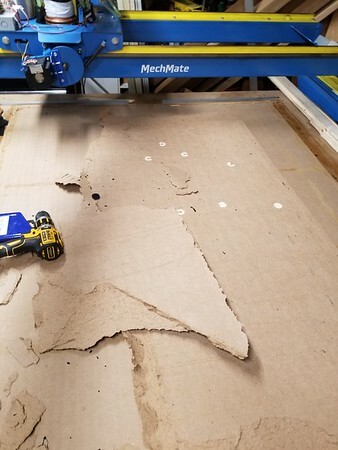 It's time for another CNC router. I've looked around, and I still think the MM is the best choice for me. If I build it, I can fix it, with off the shelf parts. #126 has a PMDX 126, ESS, and is running Mach3. Mach3 is causing me issues. I have a Mach4 licence, but have been unable to have it play nice with my spindle. Good luck with your new build. I am sure someone will chime in. I had problems with Mach 3. I looked at Mach 4 but decided against it. I changed over to Linux EMC and my machine has never run better. a spindle, VFD and some energy chain on order. I read thru your build thread and also your pdf about EMC. Nice work, and that is also a tempting system. The tipping point for me is I'm using Ger21's 2010 screen set on Mach3, which works fantastic for what I need. He has a very similar screenset for UCCNC, so I'm hoping my feeble brain has less to wrap around while changing systems. There is a Tormach screen available for Linux. Must talk to my IT friend about it. Nothing wrong with gmoccapy screen included with Linuxcnc if you need probing it can be added to user tabs, 5i25 and a simple 5$ BoB is all it takes to run a router very reliably. 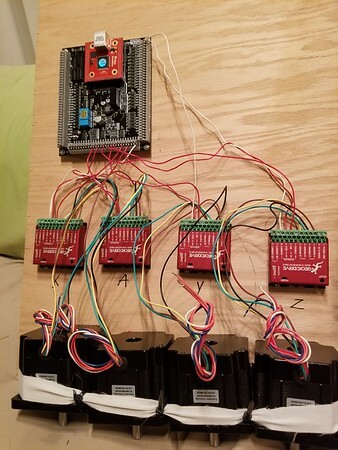 Chuck I would love to see a build based on the Acron Controller and Teknic drives. You know you may be able to do that build direct drive at first just to see how well those servos micro step. You could add belt drives after if they need more resolution. I too would also like to see an Acorn/Teknic build, and looked at doing just that. I don't want to be the trail blazer. (OK, I want to follow others proven set ups). Except for moving to the UC300eth & UB1 motherboard, this will mostly be a larger copy of my first machine. I like having redundancy. If I like the UC300 set up, I'llswap put the ESS in my first MM. I might also replace the current PMDX-126. OK, this is my other MM. I got a hold pending change order, so it's time for a new spoilboard. I glued this one on in January and I couldn't get things warm enough long enough for the glue to hold. Emergency fix was screws, which led to unhappiness. This is the first opprotunity I've had to take the machine out of service long enough to change the spoilboard. Short video of kitchen table project. No pics. I'm playing with UCCNC and Ger21's 2017 Screenset. So far, so good. Limit switches, probing, etc are working as hoped. I loaded/input my settings, and it looks like UCCNC is running much smoother than Mach3. Files are running faster, too. I hope this holds true when the actual machine is running. LOTS more parts coming. Full speed ahead! I am making some changes too. "Watch out when you come in the front door. I couldn't open the screen door because it was blocked. I can't lift it, but I got it just inside the door (about shin high). Check for damage when you open it." My MM laser parts are here! No damage, except the the MM stickers. I'll put my other half to work making another set with her Cricut machine. If I was starting again today, that is what I would use. More people are using it, and seem quite happy. Chuck good to hear you keep your machine so busy you need a second. Paul, I asked that same question nov 2015 after I purchased the plans, there has been atleast one here to upgrade from steppers to clearpath. 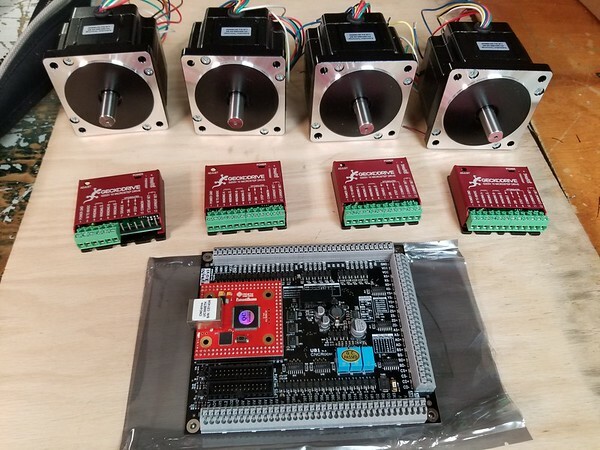 When buyingparts over last 2 yrs Complete noob to cnc like you I decided to get a cheaper stepper kit and microphone cable atleast to learn how it all works, as soon as it is finished and brings in $2500 it will be getting centroid and clearpath. All times are GMT -6. The time now is 05:27.